As of today, I am officially on vacation. I celebrated by sleeping in this morning and then taking myself out for a run before taking Dippy to the vet. Let’s just say that she wasn’t really a fan. Especially since I disturbed a perfectly good nap to dump her in a carrier and take her off to be poked and prodded. I’ve also decided to adopt Erin’s 21-day Make Me Something Good challenge. Since I’ve, you know, got some time and just bought a couple of shiny new cookbooks to inspire me to do something creative with our CSA veggies. The idea behind the challenge is this: try one new healthy recipe a day for the rest of the month and blog about it. I can’t promise daily updates, and in my case it’ll be more of a 16-day challenge than a 21-day challenge (since we’re leaving for our honeymoon in a couple of weeks), but I’ve decided not to let those things stop me. Full on ahead with creative cookery! So here are the past couple days of creativity. Yesterday, I tried out a Jambalaya-style chicken & shrimp recipe from my slow-cooker recipe book. I swapped out the white rice for brown and added a bit more liquid to compensate, and it turned out deliciously. This one was definitely a winner. In a 3.5-4 quart slow cooker, combine celery, onion, undrained tomatoes, 1.75 cups broth, tomato paste, Worcestershire sauce and spices. Stir in chicken. Cover and cook on low-heat setting for 4-5 hours. Stir in rice and 1 cup additional broth and leave covered on low heat for another 1-2 hours or until most of the liquid is absorbed and the rice is tender. Stir in shrimp and green pepper. Cover and let stand for 10-15 minutes, or until shrimp is heated through. My other experiment happened at breakfast this morning, when I swapped my oatmeal out for bulgur. I cooked it exactly the same way, just with a different grain. The results were decent – the chewier texture was a nice change, but I think I would have been happer with a more savory result. Combine bulgur, almond milk, banana and cinnamon in a small pot on the stove and bring to a boil. Turn the heat down to medium-low and cover. Simmer for 12-15 minutes. Stir and transfer into a bowl. Top with peanut butter. Let sit a minute or two before stirring the peanut butter in. Enjoy! Last year, after we got our engagement pictures back from the photographers, one of the first things I did was use my favorites from the bunch to make my very own 2010 wall calendar. I did it through Shutterfly, and not only was it stupidly easy but the result was fantastic. I’ve loved looking at that calendar every day so far this year, so there was absolutely no question that I’d be making another one for 2011 filled with my favorite wedding photos. 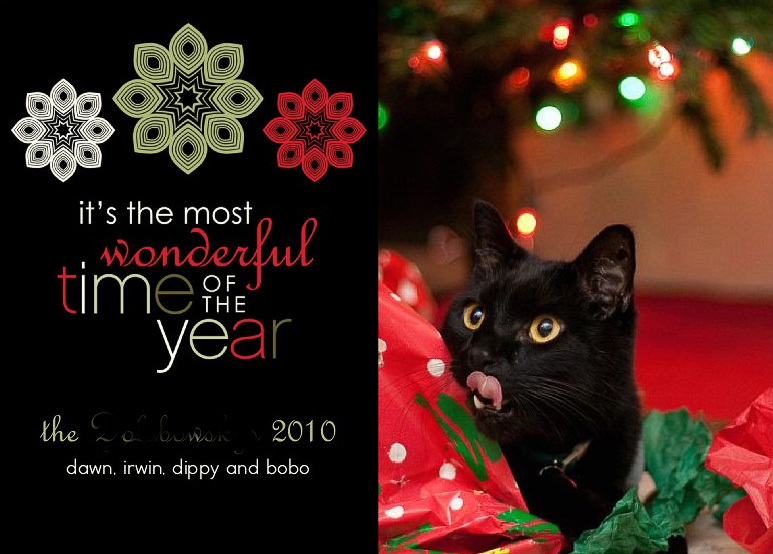 One of the other things I wanted to do with the wedding photos was to make Christmas photo cards with them. Sending out Christmas cards is something I get ridiculously excited about and love doing, and if we had a beautiful wedding photo to use for it? Well, that would justify spending the money on custom photo cards instead of picking up a couple of boxes from the local Walgreens. I was all set to go with that idea until I found myself flipping through my Flickr stream a few days ago and realized that I had a much, much better option right in front of me. Remember last year, when we got the cats totally stoned out on catnip and then took pictures of them? One of those would make a much better holiday card. 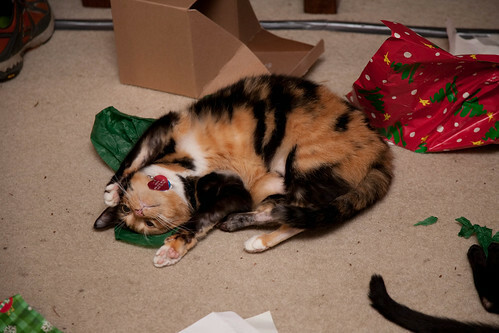 Because nothing says happy holidays like a cat stoned out of its damn mind. Yeah. I’m thinking this one is totally the way to go. Who wants wedding pictures when they can have Bobo with a wicked case of the munchies? Tonight, The Boy and I exchanged our Christmas/Hanukkah gifts before departing for Michigan. This year, I decided to get the cats a couple of presents, too, including some catnip toys. Apparently these toys were made with the good stuff, since the box they were wrapped in kept moving all over the living room. 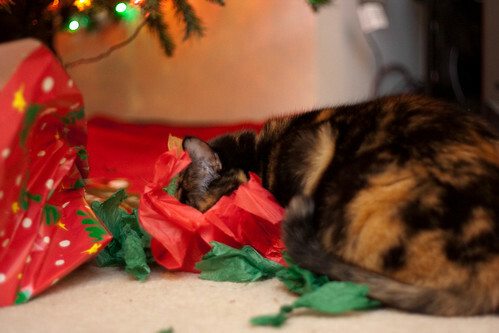 We’d see the cats attacking it every now and then and the wrapping paper was certainly a bit worse for the wear. In all honesty, I was surprised the box survived its week under the tree as well as it did. We never actually gave the cats their new toys tonight. 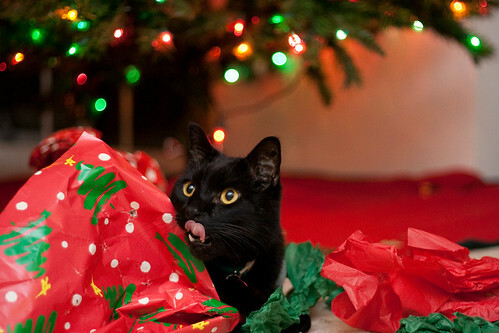 Instead, they were perfectly content to play with the tissue paper, box and wrapping paper I’d wrapped them in. (Did I mention that the catnip toys were in plastic bags? This must be the really, really good stuff.) So, it’s a quiet night at home, the cats are stoned… what else is there to do but take pictures? And then publish them on the internet? You can see the full set here. Most of them are of Bobo, since Dippy got a little spooked by the camera. The tales of a physical therapy student living and running in the Pacific Northwest. You can also find me on Twitter and Facebook. Questions or comments? Email me at runningdawnie@gmail.com. Science, and Training, and Knitting! Oh My!